ALERT! Think you can avoid glyphosate by buying organic? Think again. 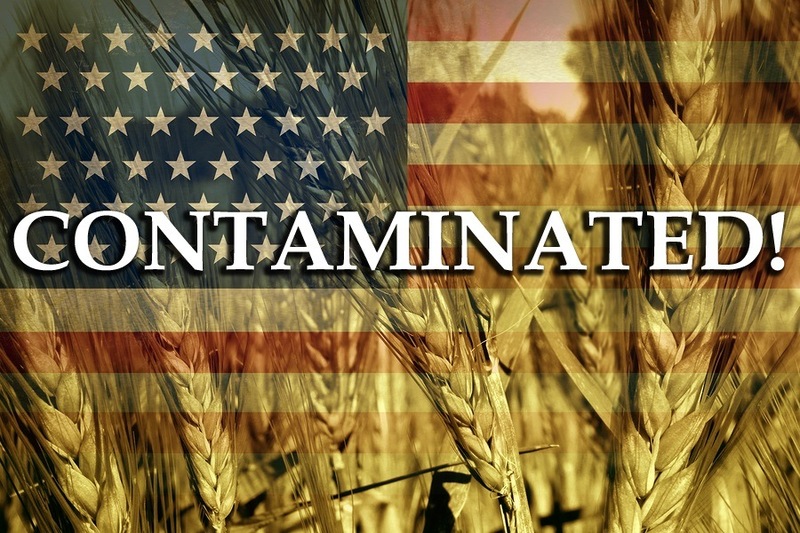 A shocking new investigation by Tropical Traditions reveals that many products in the organic grain market in the U.S. contain glyphosate residue at levels almost the same as conventional grains. And Organic, USA, can have ANY AMOUNT OF GMO IN IT!. As long as the organic farmer didnt plant GMO seed, ie it could be all cross pollinated GMO, all the neighbours GMO seed could have washed into his crop.......... damn a truck could have dumped the lot of seed in his paddock............... It doesnt matter, the Organic crop can be any amount of GMO,,, 20% or 90% all GMO, doesnt matter, USA laws still state it can be called 100% Organic. That is why China is rejecting all the grain shipments from USA, when they buy NON GMO, they expect non GMO. USAs food supply, is so infected with GMOs now, it is unable to send a real non GMO shipment anywhere in the world. As for Organic crops still being called organic, even if massively infected with GMOs being still called Organic? ONLY IN THE USA!~ are laws so ridiculous. It is as absurd as the claims Flints water supply is 100% springwater, fresh and pure, has no pollutants. Because the water supply company, DIDNT ACTUALLY TIP IN THE LEAD? Only in the USA, can the laws prove a barn painted red, is actually green? Worst than the GMOs is the glyphosate use in roundup and other chemicals from other pesticides. The informations is being diluted, chopped up and fragmented in ways that it is difficult for the population to get a grip on things. Here's a recent article on the toxicity of Glyphosate. Not the conclusion of this experiment on animals. Toxicology. 2014 Jun 5;320:34-45. doi: 10.1016/j.tox.2014.03.001. Epub 2014 Mar 15. Mechanisms underlying the neurotoxicity induced by glyphosate-based herbicide in immature rat hippocampus: involvement of glutamate excitotoxicity. Cattani D1, de Liz Oliveira Cavalli VL1, Heinz Rieg CE1, Domingues JT1, Dal-Cim T1, Tasca CI1, Mena Barreto Silva FR1, Zamoner A2. Previous studies demonstrate that glyphosate exposure is associated with oxidative damage and neurotoxicity. Therefore, the mechanism of glyphosate-induced neurotoxic effects needs to be determined. The aim of this study was to investigate whether Roundup(®) (a glyphosate-based herbicide) leads to neurotoxicity in hippocampus of immature rats following acute (30min) and chronic (pregnancy and lactation) pesticide exposure. Maternal exposure to pesticide was undertaken by treating dams orally with 1% Roundup(®) (0.38% glyphosate) during pregnancy and lactation (till 15-day-old). Hippocampal slices from 15 day old rats were acutely exposed to Roundup(®) (0.00005-0.1%) during 30min and experiments were carried out to determine whether glyphosate affects (45)Ca(2+) influx and cell viability. Moreover, we investigated the pesticide effects on oxidative stress parameters, (14)C-α-methyl-amino-isobutyric acid ((14)C-MeAIB) accumulation, as well as glutamate uptake, release and metabolism. Results showed that acute exposure to Roundup(®) (30min) increases (45)Ca(2+) influx by activating NMDA receptors and voltage-dependent Ca(2+) channels, leading to oxidative stress and neural cell death. The mechanisms underlying Roundup(®)-induced neurotoxicity also involve the activation of CaMKII and ERK. Moreover, acute exposure to Roundup(®) increased (3)H-glutamate released into the synaptic cleft, decreased GSH content and increased the lipoperoxidation, characterizing excitotoxicity and oxidative damage. We also observed that both acute and chronic exposure to Roundup(®) decreased (3)H-glutamate uptake and metabolism, while induced (45)Ca(2+) uptake and (14)C-MeAIB accumulation in immature rat hippocampus. Taken together, these results demonstrated that Roundup(®) might lead to excessive extracellular glutamate levels and consequently to glutamate excitotoxicity and oxidative stress in rat hippocampus. "some scientists believe it may well be the most toxic chemical ever approved for commercial use"
Can you provide a source to this statement? You know, quality journalism where you reference your sources. Glyphosate is not even considered toxic, yet somehow it is maybe the most toxic as rated by possibly some scientists. I would like to know who these scientists are. I don't disagree that we may in the future find some long term effects from exposure to the product, but there are no immediate effects that would make it toxic. Will the study Tropical Traditions conducted to evaluate glyphosate residue in non-GMO commercial crops and organic crops be published in a peer-reviewed journal? It sounds like a potentially compelling study, although it is hard to tell from the limited information provided here how the study was conducted. There are so many possible areas of contamination for sampling and analyzing low-levels of pesticides and other organics that it is crucial to understand/document the field and lab sampling protocols and quality assurance used for a study like this before evaluating the conclusions. I would be very interested in the study and results if/when it is published. Also, I have read anecdotal accounts of glyphosate dessication and just as many accounts by farmers that it does not occur, but I have not found any factual evidence to support it's prevalence (or not). Do you have any factual, data sources (non-anecdotal) on the prevalence of this practice? It seems quite simple to me. The myriad samples of "non-GMO" and "organic" from various farms and states tested positive for glyphosate. That's enough to scare me off. I think we ALL need to take up the study of organic farming and grow our own food -- local, seasonal, cooperative farms. Admin said: > ALERT! Think you can avoid glyphosate by buying organic? Think again. A shocking new investigation by Tropical Traditions reveals that many products in the organic grain market in the U.S. contain glyphosate residue at levels almost the same as conventional grains. Thanks so much for running this series of stories. Would you publish a story on the levels of Gly and AMPA that you are accepting in Tropical Traditions products? Thanks and God bless. Writing to you from NE China where the chemtrails don't exist and the use GMOS is almost none and little Roundup is used. Admin said: > ALERT! Think you can avoid glyphosate by buying organic? Think again. A shocking new investigation by Tropical Traditions reveals that many products in the organic grain market in the U.S. contain glyphosate residue at levels almost the same as conventional grains. Looking at the chart, year 2000 was the expiration of the Roundup patent, and that was when there was generic competition driving down the price. The FDA is useless. Completely incompetent and useless. The only way this stops and is controlled is if WE THE PEOPLE make it so. We "make it so" with our pocketbooks. Things like the non-gmo project, and perhaps a different 3rd party organic standard is needed which is more stringent than USDA Organic classification. Educate as many people as you can. This stuff is an endocrine disruptor, no doubt about it. Go read the full article by Seneff at MIT. Roundup is also an antibiotic, it is killing off critters in our microbiome which are responsible for all kinds of processes in our bodies, it is why we have increasing gut disorders, leaky gut, increasing allergies as a result. Diabetes is on the rise, significantly. Did you know your gut critters if in good balance produce short-chain-fatty acids which affect glucose processing and metabolism? Talk to your grocers. Yesterday I emailed several producers of products I like but won't buy unless they get organic and non-gmo certified. This is just the tip of the iceberg folks! Consider: * The USDA's list of allowed chemicals on Organic products is long and full of synthetic chemicals. * The US operates on the 'it's safe until proven otherwise' principle, the opposite of the EU's precautionary principle. * Tens of thousands of industrial chemicals are in wide use, without any meaningful safety testing! How many of them are allowed on Organic foods?! * Chemical safety testing is based on the one substance alone in healthy individuals. No special populations. No combinations of any other chemicals. * Chemical safety standard levels are based on a linear dose-response assumption, which may not be the case, eg, hormone disruptors. * It's been widely reported that many scientific journal peer reviewed articles' results are not reproduceable, ie, false conclusions. * Who's go the $ to independently test all this outside the chemical manufacturers whose interest is hopelessly conflicted??? * There's strong evidence of widespread regulatory capture, by political appointment, budgetary control, personnel coercion, lobbying, makeup of Boards and Commissions, ad nauseam. * The public, at the levels needed to transform the food industry, remains blissfully ignorant. There's no mass media education outlets which support any of this. The internet is the only venue and it's making progress, but the progressive food industry ideas are barely represented in Congress, in treaties, in agencies, on Gov't Boards and Commissions, in laws & regulations. Until they are, the market is the only venue of change, which is growing but too slow. So there's lots of argument the regulatory system needs to be transcended with something better. Maybe by a certification and labeling NGO funded by sales of organic products??? GOD BLESS TROPICAL TRADITIONS FOR THEIR GODLY STANCE AND PROCEDURES AND PRODUCTS OFFERED TO A WEAKENED REPUBLIC! In the name of Yeshua the Messiah i pray to our HOLY FAITHER ALMIGHTY HaShem keep your company! Ever since USDA has been involved in the organic rules and regulation business they have been diluting and lower organic standards to allow big companies access to the rapidly growing demand for organic food. One such move on the part of USDA was to allow the use of manure from CAFOs to be applied on certified organic land. This CAFO contains glyphosate, AMPA or aminomethylphosphonicacid (the first metabolite of glyphosate) and other chemical residues as well as antibiotic residue in the manure. Thanks for a great article, will be sharing with my mailing list and asking them to share on!